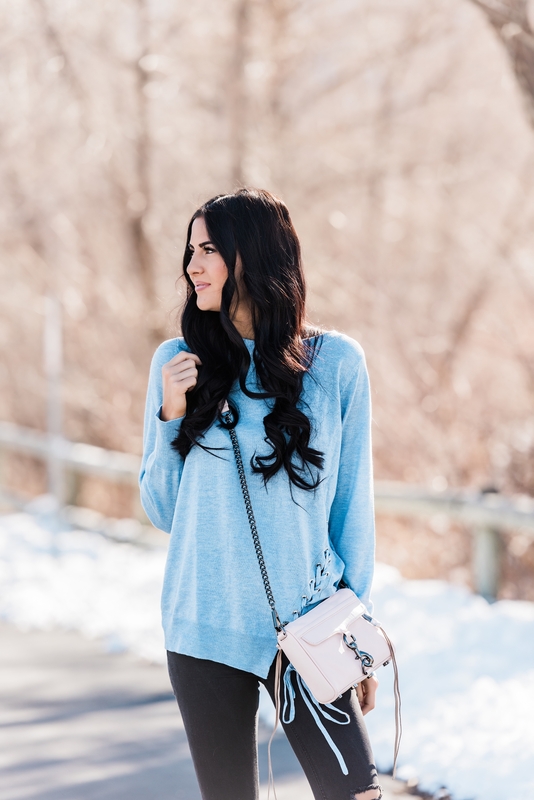 With spring right around the corner it’s time to pull out our pastels and light sweaters!! I wore this look a couple weeks ago when the snow finally melted and we had some sunshine here in UT! Have you guys heard of Amazon Fashion? Basically it’s a fast-growing destination for clothing, shoes and accessories with options from contemporary designers like Vince and AG to love-priced unique finds. They even have their own private label brands! Similar to Amazon.com, you can truly find anything you’re looking for as far as fashion goes! I found my entire look on Amazon Fashion and if I’m being completely honest, I spent a good hour or so browsing and shopping for cute pieces for spring (don’t tell Drew!! Actually he loves Amazon just as much as I do so he probably won’t care haha ;). I really love this pastel sky blue sweater and these matching UGG boots. I actually already own a couple different pairs of UGG boots and I love them because they are perfect for the winter!! But this color is so gorgeous so I had to get them to add to my collection! I love going through Amazon fashion! So many amazing things to buy haha! Beautiful shade of bleu, sImplY sweet look! ???? Loving the blues in this look! Gorgeous color on you! I love that blue top! It’s gorgeous! This is such a lovely casual look! The pastel color of the sweater is so pretty! Love the color and the side detailing on that sweater! Love this gorgeous blue sweater! It looks amazing on you! this sweater is so cute, love the color. I love this look! so cozy and cute! Where are these pants from? I really like them! What size are you wearing in the sky blue Amazon Sweater? Thanks!